We've now lived in the Netherlands for a year, and I've still not found a proper "Cyclists Dismount" sign. I know what they should look like. the Dutch equivalent is "Fietsers Afstappen", and I have plenty of experience of encountering these things from cycling in the UK so I know what I'm looking for. However, they appear to be a theoretical possibility rather than a reality. All I've found so far have been temporary signs erected around roadworks (though roadworks don't normally hinder Dutch cyclists), and cyclists are (quite reasonably) asked to dismount here in Assen when the market has completely filled the street. However, as of the time of writing I've not ever seen a permanent sign. At the start of the 2006 Study Tour I offered €10 to the first person to spot a sign which read "Fietsers Afstappen", knowing that even though we were going to places where I'd never cycled before, there was very little chance of finding such a sign. I kept my money. These signs can be seen as a bit of a joke, but they're much worse than that for cyclists. The problem is that each time you slow down and stop you lose a lot of momentum. It's like increasing your journey length by several hundred metres. This is why direct and uninterrupted cycle routes are such a good idea. Luckily, the planners here provide exactly that. Of course it's not just important for commuters that routes should be convenient. It also makes cycling holidays far more relaxing and enjoyable. At the end of this you may be wondering what happens in the Netherlands to avoid this problem. Try looking at these examples of making cycle routes direct. In the Netherlands, rural roads are also a pleasure for cyclists. The reason is that there are very few cars using them. Many rural roads only offer convenient through routes by bicycle. Drivers are encouraged to take other routes. The signpost to the left stands in the village of Peize, which has just over 5000 residents. It is fairly typical for rural areas. Note that there are directions given to 9 different places by bike (the red writing on a white background), but drivers are offered only "all directions" (white writing on a blue background). There are 29000 km of cycle path in the Netherlands and 130000 km of road. What is often not understood outside this country is how much of the "road" is also (almost) only for bikes. Motorists can only follow the motoring routes, not the cycling routes. As a result, the majority of country roads are almost like cycle paths in all but name. The experience of riding along them is almost completely free of cars. There are many other examples of smooth cycle paths next to (deliberately) rough roads. Not just the towns, but also the countryside has to a large extent been "traffic calmed". Sections of road joined by cycle path make through routes for cyclists, not for drivers. It makes cycling a pleasure. We hear a lot about integrated transport, but what does it mean ? I've always assumed this referred to being able to switch between modes as convenient. So, it's useful if train stations and bus stations are in the same place. It's also rather useful if you can leave your bike somewhere sensible if you wish to take a train or bus. This is done wonderfully well in the Netherlands. In virtually every town, the train station is located in the same place as the bus station. There is also nearly always a bicycle shop including cycle hire of two kinds - OV-fiets (public transport bike) for regular commuters to take each day they arrive in the city and the regular kind for people who just rarely hire bikes and want one for a few days when visiting. You'll also find plenty of cycle parking at the railway stations, and also at bus-stops in town - the bikes shown in the picture are at a large bus-stop in a residential part of Assen - and even at bus-stops out in the country. Click to see on Google Maps Since this blog post was written, more car parking spaces have been converted into cycle-parking. The greenish area in the centre top of this image and the cars parked to the top left of that area are now areas of extra cycle-parking. For more examples of ample bicycle parking so that bikes can be used with other forms of transport see my videos of cycle parking at Assen Station and at Groningen Station, or see all the Integrated Transport, bus, Cycle Parking or Commuting stories. There are also some examples of parking on the photos page. What a difference a sign makes. The sign on the left is increasingly common at junctions in the Netherlands. It indicates that cyclists will get their own green phase at the lights and that when the light is green they can travel in any direction across the junction, including diagonally. What's more, cyclists usually get two green phases per complete sequence of the lights, meaning that they wait for less time behind a red light. This leads to cyclists getting past the lights quicker than drivers. It works very well indeed. A couple of days ago I made a video of riding across such a junction when I visited Groningen. Also there is a video of the same junction made by the fietsberaad, the Dutch panel of experts in cycling, which demonstrates the same junction from different angles. Please also read other later / better blog posts about simultaneous green traffic lights. Also see many other examples on this blog of infrastructure which makes cyclists' journeys faster. A high level of cycling doesn't maintain itself. Nothing is left to chance here. Cycle paths are designed in first in new developments and cyclists are not expected to slum it by sharing space with buses. The picture shows a bus waiting at a bus stop on a bus road. This road is not a through road for cars, and has quite light use by buses, but cyclists are provided with a separate wide cycle path so that any possible subjective feeling of lack of safety is avoided. There is also a pedestrian path because cyclists and pedestrians don't mix very well either. Note that the bus road is not a new road. This was the main route for all traffic until the 21st century when private motor vehicles were redirected to a different route and only buses and cyclists could remain on this route. Unravelling of routes reduces conflicts and reduces the need to slow down and stop. This can give both cyclists and public transport an advantage over private motor vehicles. It's essential that cyclists are always catered for. Subjective safety should always be maintained. Having buses pass you or pull in or out on the road you're cycling on does not lead to a feeling of subjective safety and that's why combined bus and cycle lanes are not sufficient fort any place which wants mass cycling. When there are road works, the cycle route still has to be maintained. Temporary bridges are put up. While cycle paths are being resurfaced, an alternative route is provided by redirecting cyclists onto safe and convenient routes. Note also the bicycle parking at the bus stop. There is very nearly always cycle parking at bus stops just as there is very nearly always a bypass for cyclists to avoid danger at bus stops. There is no need for buses to impact negatively on cyclists. Seen many cyclists recently ? There is a huge difference between the rates of cycling in different countries. 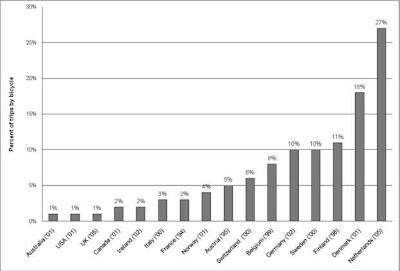 The graph on the left shows the rate of cycling as a percentage of all journeys made in sixteen different countries. This is also known as a modal share or modal split. Australia, the USA and the UK are at the left with 1% of all journeys by bike, while Finland, Denmark and the Netherlands are on the right with 11%, 18% and 27% of journeys by bike respectively. There is a huge difference between the numbers of cyclists you see in different countries. There is also a huge difference between their behaviours. So, back to the question. How many cyclists do you see when you go out, and how many of them are dressed in a way that indicates that they feel they have to worry about their safety on the roads ? Are your cyclists a small part of traffic, wearing helmets, dressed in fluorescent jackets and predominantly young and/or "sporty" ? Do your cyclists cycle "vehicularly" and identify themselves as "cyclists"? Or do you live in a location where cyclists are of all ages, both sexes, and generally ride in normal clothes with no worries about visibility ? Cyclists are the pit-canaries of the roads. If they're numerous, dressed in ordinary clothing and wide-ranging in age you can tell that you are in a location where cycling is "normal" in society and where it is safe enough, and feels subjectively safe enough, that everyone cycles. If people feel they have to dress to be safe then this is a sign that they do not have adequate subjective safety. It goes further. Do you see women routinely cycling alone at night ? Do children cycle long distances alone, day and night ? Do most children go to school by bike ? Do parents consider it to be safe for their children to do this ? Do those parents who do let their children cycle make them wear helmets and fluorescent clothing ? These are indicators of how subjectively and socially safe people feel and are a determinant of health of cycling in an area. Make cycling a truly attractive thing to do and more people will do it. Here in Assen, children are regularly seen riding great distances with groups of friends. Some cycle 20 km to school in the morning and 20 km back again each evening. Take a look at a video of how children get to primary school here. As mentioned a few days ago in "Reclaiming the streets", cyclists are also the pit-canaries of society. Societal problems can also lead to low rates of cycling. If there is a significant risk of mugging (or worse) in your area, you will see fewer cyclists. This is a problem for social safety. It is surely no co-incidence that the three countries with the highest cycling rates also have progressive social policies. You will find a very similar ranking of countries in the results of a UNICEF report summarized by the BBC with the title of "Why are Dutch children so happy ?". Dutch infrastructure works so well to convince people to cycle that recent immigrants to this country cycle on average about as much as people who live in Finland. The graph at the top is from John Pucher and Ralph Buehler's article "How Cycling was made Irresistible" - one of many articles referenced on our cycling articles webpage. The Dutch really have made cycling into an irresistible thing to do. Everyone cycles for at least some of their journeys. We run cycling study tours here in the Netherlands on which we demonstrate the how it is that the Dutch have achieved their amazing high cycling modal share. We also run cycling holidays in this location, which we believe is the most pleasant in the world for cycling. 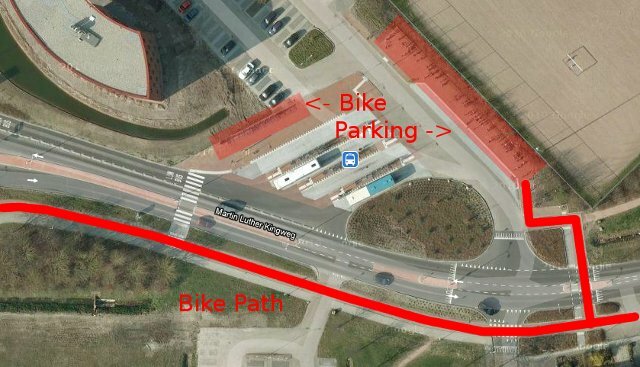 Sadly, since this blog post was originally written, the cycling rate in Denmark appears to have dropped quite sharply.